Have an Extra Couple of Million Dollars Lying Around? From the WSJ comes this tale of $3M luxury condos in Concordia KS – located about 200 miles west of Kansas City. Or more specifically, the middle of nowhere. The attraction? A developer has re-purposed a vacated ICBM missile silo into the ultimate survivalist lair. And as a result, he has attained a degree of financial freedom many would envy. Doug Immel recently completed his custom-built dream home, sparing no expense on details like cherry-wood floors, cathedral ceilings and stained-glass windows — in just 164 square feet of living space including a loft. The 57-year-old schoolteacher’s tiny house near Providence, Rhode Island, cost $28,000 — a seventh of the median price of single-family residences in his state. Not many people would be comfortable living in 200 sft. But I wonder how many would have a happier life trading that unused 3rd, 4th or 5th bedroom for a greater degree of financial freedom. 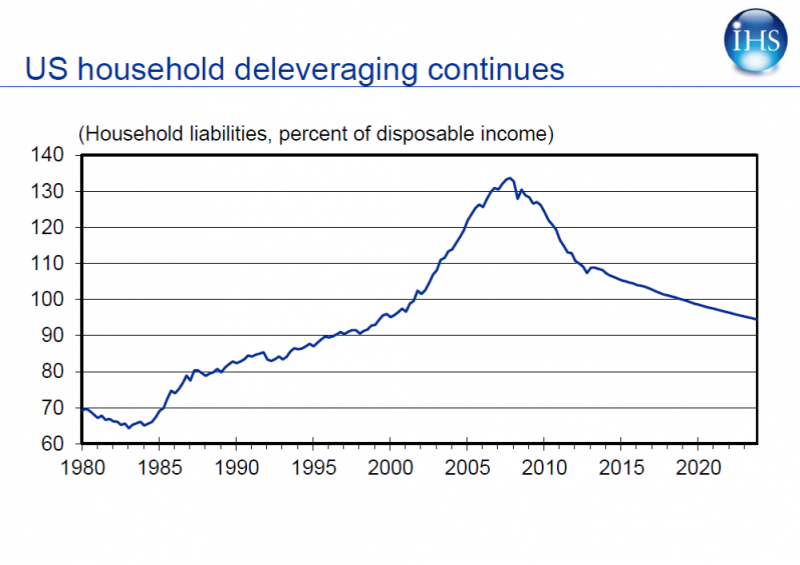 The WashPo’s Wonkblog writes that household formation is on a steady rise. If sustainable, this is hugely inportant for the US economy. Back before the financial crisis, my former economics professor, Ed Leamer, presented a paper to the gathering at Jackson Hole claiming that as goes housing construction, so goes the US economy. This was not, and is still not, conventional wisdom. But Ed knows his data and if home building is rebounding, then I suspect a stronger recovery may be around the corner. This is also the position taken by Goldman Sachs, as I learned from a breakfast meeting this week. 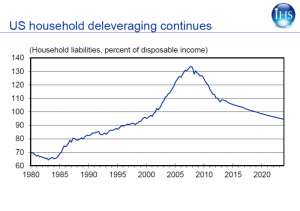 Supporting the potential of economic growth, along with new household formation, is the continuing decline in private debt ratios. These have been steadily improving since the financial crisis and look to be headed back to the more normal levels last seen in the 1980s and early 1990s. Time to Refinance … Again? Good for borrowers, bad for savers, interest rates continue to decline. With 30 year fixed mortgage rates hovering around 3.5% (down from 4.5% a year ago) and 15 year rates below 3%, it may be time to check the rate on your current loan. Obtaining a mortgage these days is no picnic, as banks are apparently making up for the “can you fog a mirror” qualifying test of the last decade, with the full body orifice search procedures of today. But if you have the resources to qualify, there has never been a better time (and how many times have I said that in the last five years!) to refinance a home loan. The only challenge is deciding whether to pay points to get a lower rate – costs you will lose if rates slide further and you do another refi – and accepting a higher rate for a no, or low, cost loan today. And not only a bottom in US housing but new hope for the spirit of American entrepreneurship as well. How else could one respond to this story of Willow Tufano, the 14 year old Floridian who has bought a house in foreclosure, rented it out at a profit, and is even able to source furniture for her tenants. Reuters dissects the failure of the Federal judiciary to prosecute cases against the players in the mortgage meltdown. The documented record of law-breaking that the article exposes is damning, as is the lack of effort by the US Attorney’s Office to take any significant action. More than 16 million children are now living in poverty and, for many of them, a proper home is elusive. Some cash-strapped families stay with relatives; others move into motels or homeless shelters. But, sometimes those options run out, leaving an even more desperate choice: living in their cars. This from a segment on CBS News’ “60 Minutes” last night. That able-bodied Americans are having to live in parking lots, with their families, is appalling. Mortgage rates reached record lows this week… The average rate on a 30-year fixed-rate loan fell to 4.15 percent, with borrowers paying an average point of 0.7 percent. That rate is down from 4.32 percent last week. A continuing story it seems. Now, if only anyone could get a loan. We are looking more and more like the Japanese experience where interest rates have been stuck at historic lows and the economy in low gear for 20 years.